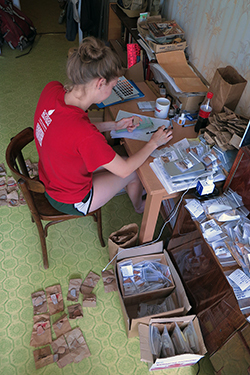 Archaeology and classics double-major Claire Zak spent her summer digging for artifacts 7,000 miles away from home. 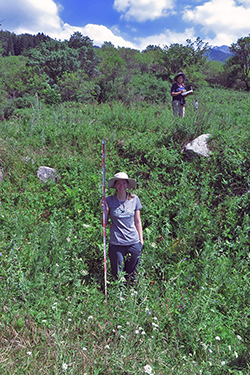 Sweet Briar Professor Claudia Chang and Chang’s husband, archaeologist Perry Tourtellotte, had invited the rising junior and anthropology minor from Saint Cloud, Fla., to assist them at an Iron Age site just outside Almaty, Kazakhstan. Claire Zak measures the depth of a winter house in the Orman Region during a field survey, with Claudia Chang in the background. Photo by Perry Tourtellotte. Dating back to 400 B.C., the dig site, Tuzusai, is located in southeastern Kazakhstan in the Talgar region. Chang has returned to the area frequently for more than 20 years to continue her research on the country’s farmers and herdsmen. A National Science Foundation grant brought her back in 2011, and in 2015, Chang and Tourtellotte spent the fall semester doing research in Kazakhstan and traveling to India, Singapore, Indonesia and Malaysia. And because there is so much to see in the region, weekends were also jam-packed with archaeology-related activities, such as visiting museums and cultural sites. One destination was Bishkek, the capital of neighboring nation Kyrgyzstan. From there, Zak traveled to Lake Issyk Kul, the second-highest lake in the world. Before heading to Kazakhstan in mid-June, Zak told us how excited she was to “experience archaeology in its true form.” There was only one thing she looked forward to more: immersing herself in an entirely new culture. The field training Zak received during her monthlong internship has helped her better understand what archaeology is and how it works — from specific excavation methods to taking field notes and mapping her findings. She says it’s allowed her to refine her own lab research, data collection and analysis skills. Zak analyzes and draws pot sherds for her internship project and in preparation for her Senior Honors Thesis. Photo by Perry Tourtellotte. Back at Sweet Briar this fall, Zak will continue to follow her many other passions, as well. She’s on the swim team, works in admissions and as marketing coordinator for the Outdoor Program, is president of the Student Athlete Advisory Committee and is on the Honors Program Student Council. Being able to do it all was one of many reasons she chose Sweet Briar. 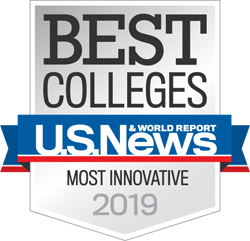 “Not only do I receive an outstanding and rigorous education, I am also able to balance a varsity sport, a few clubs and jobs, while also having fantastic internship opportunities,” she says. Zak says she was among the first in her group of friends to return to Sweet Briar after it nearly closed.